It’s time for the Secret Recipe Club Group A reveal. This month Chef in Disguise written by Sawsan was my assigned blog. 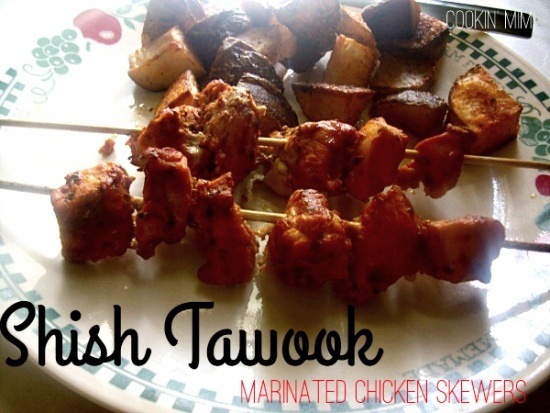 Since I have who knows how much chicken in my freezer I went in search of chicken recipes and found the recipe for Shish Tawook which are just marinated chicken skewers, The recipe calls for really simple ingredients but the end result is quite tasty. Combine all ingredients except for chicken in a bowl. Place chicken in a zip top bag. Pour marinade over chicken and refrigerate for several hours. Place chicken cubes on metal or wooden skewers that have been soaked for at least 30 minutes. Grill over medium high heat or bake at 425 degrees for 10-15 minutes or until chicken reaches 165 degrees. Those look awesome. I was looking over the recipe and I have everything I need to make them. Thanks for the fab dinner idea! That looks delicious! And I am always looking for recipes that I prep, but that my husband grills! Thanks for sharing with the SRC. This looks amazing…and I am always looking for recipes that I prep, but that my husband has to cook. Thanks for sharing with the SRC. I love the simple ingredients and I can’t wait to try this. I love the idea of tomato in the marinade. I’ve never tried that before. It looks absolutely delicious. This looks delicious- simple but what a great recipe! This sounds wonderful and so flavorful! Fast, easy, and super flavorful. Love this type of recipe! So simple and sound yum! that marinade sounds soooo good. love the idea of tomato in it! That marinade sounds so tasty! Sounds like a great combo of flavors. Made this tonight. Super-easy, and delicious! We specialise in traditional Lebanese cuisine & so when I see Shish Tawook that uses soy sauce, it’s really not doing any justice to Lebanese cuisine which is simple & clean. No offense meant, I eat Asian dishes & cook them for my family, but would never advocate using this item on our menu!